World Number 1 and top seed Novak Djokovic produced a flawless display of tennis, playing shots of the highest caliber as he dismantled second seed and great rival Rafael Nadal 6-3, 6-2, 6-3 in the Australian Open final at Melbourne. The Serb just dropped eight games all along in one of the most one-sided Australian Open finals in recent years. Much to the disappointment of neutrals, it was not to be a repeat of their near 6-hour marathon at the 2012 finals. Djokovic has played seven Australian Open finals and won all seven of them. His win helped him move ahead of Roy Emerson and Roger Federer for the most Australian Open titles of all time. The triumph, his 15th in Majors, also moved him ahead of Pete Sampras to third in the all-time list of Grand Slam winners - only behind his contemporaries Nadal and Federer. Djokovic has also climbed up the list for most Grand Slam men’s singles titles won after turning 30 years old. He is now joint second on the charts (along with Nadal) with three wins - that's just one behind Federer, Rod Laver and Ken Rosewall. Djokovic's place at the summit of the ATP rankings didn't hinge on his victory in the final; he would have remained World No. 1 anyway. But the win has helped him solidify his lead at the top; he will be at 10,955 ATP points when the rankings get updated on Monday, which is well ahead of Nadal's tally of 8320 and Alexander Zverev's total of 6475 points. It is going to take something special from the rest of the pack to dethrone Djokovic from the top in 2019. 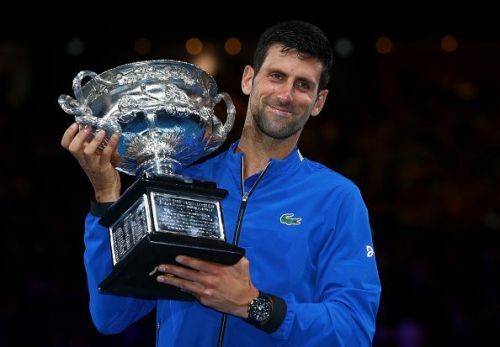 After collecting a cheque of $4.1 million AUD ($2.9 million USD) for his exploits in Melbourne, Djokovic also inches closer to the $130 million earnings mark with $128,792,178 in prize-money earnings - an all-time record. With his win against Nadal, Djokovic has now won three straight Slams, following Wimbledon and the US Open last year. Most remarkably, he is the first player ever to win three Slams or more in a row on three separate occasions. Previously Djokovic had managed to go on streaks of four (Wimbledon 2015 to French Open 2016) and three (Wimbledon 2011 to Australian Open 2012). He will be looking to win his second 'Nole Slam' at the French Open later this year - a feat that he achieved in 2016. At 31, with 15 Grand Slam titles already in his trophy cabinet, the Serb is inching closer and closer to Nadal and Federer's tally, and he could well surpass the two. Irrespective of whether that happens or not, Djokovic has certainly made a strong case for the 'GOAT' tag yet again.